Welcome to the first of two blog posts devoted to the Fire in the Triad Semifinal dinners. Please follow me on twitter @niksnacks and the hashtag #CompDiningNC for live updates during each battle (dinner begins at 7pm). Are you attending Fire in the Triad and/or keeping up with the blog? Don't be shy, give me a shoutout! 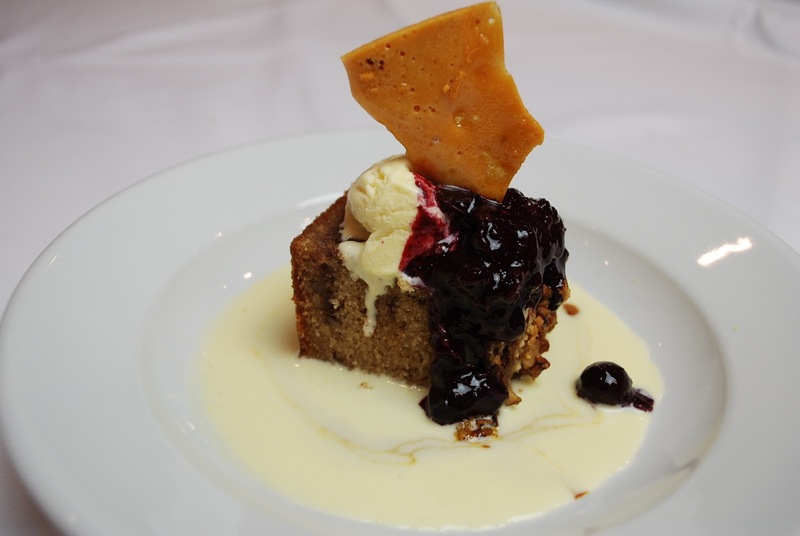 And don't forget to "like" Competition Dining on Facebook and point your browsers to the web. Last night, it was Battle North Carolina Eggs between Chef George C. Neal of 1618 West in Greensboro and Chef Chris Blackburn of Josephine's, also in Greensboro. There were poulet rouge (chicken) eggs, duck eggs, quail eggs, ostrich eggs--at least 3 of the four categories of eggs had to be used in three courses from each chef. Laura of Carolina Epicurian. She was one of the first people I connected with wayyyy back when I became a blogger back in 2007, when she was the Hendersonville Epicurian. We finally met in real life last night and I can't wait to meet up with her again! Not guest judges, but equally amusing, I met and sat with fellow bloggers from Triadfoodies.com and we exchanged witty food banter all night. It was truly a fun night. It's such a joy to be surrounded by people who are as passionate and excited about food as I am. The owners of 1618 West and Josephine's were sitting together at a table. It may have been heated up in the back of the house between George and Chris, but in the front of the house, there was nothing but love (and wine and perhaps a cocktail thrown in). It is said that the chef's toque (pronounced: toak) has many folds because each fold represents the number of ways a chef knows how to cook an egg. I was interested to see how each chef would take such a simple ingredient and make us diners love each course. How many folds are in mine? Created by Chef Blackburn, everything in this dish was light, elegant and lightly scented with Indian-inspired undertones. The chorizo was spicy and very hot (in temperature) compared with the rest of the dish. The grilled red pepper bisque was creamy and flavorful. The samosa was light and flaky and the crunchy pappadam was almost like a corn chip. My quail egg was astride the other components (see below) of the dish and it really wasn't utilized the best, I thought. It was cooked well, but if it weren't there, I would not have missed it. After I'd eaten everything, the light spice of each component was pleasantly lingering in the back of my throat. My singular cilantro leaf. Boop. As this course came out of the kitchen, the aroma of scallops filled the room. Everyone at my table knew this was Chef George's dish. "Seafood, duh!," said one diner. A beautiful showing of the perfect scallop with an interesting new take on sushi: scrambled egg and chorizo. The egg was still warm and soft, the chorizo spicy and cradled by the rice and the nori--it was egg-actly what I needed. I dipped my chili-glazed onion ring in the tomato sauce and the cherry reduction and I wished I'd had 5 more just like it. The first item of the competition that was touted as glazed that was actually glazed. Thank you, Chef. Chef Blackburn's second dish and my personal favorite, this dish really whet my appetite. I immediately took my crunchy and flavorful Parmesan cookie off the top and started to munch on it when I realized I should save it for later. I'm glad I did. There were smoked bits of lamb and pheasant that didn't make it onto my fork and landed in the espagnole. I needed that cookie to corral the meat into my mouth. The shrimp hollandaise didn't taste very shrimpy (bits or chunks of shrimp in it would have been great) and there wasn't much of it on the plate to really gauge the flavor, but I liked it just the same. When Chef George's second dish came out, people were wondering how the steak would taste with less than 6 hours time to marinate. Let me tell you: it was excellent. Tender (and a bit more well done than the photo leads you to believe), and perfect with the ostrich egg hollandaise. OMG--let me tell you about this hollandaise: You know how hollandaise is the perfect marriage of yolks, butter, lemon, heat & patience? Well, use an ostrich yolk (which is the equivilent of SIXTEEN eggs), and you get the richest, thickest, most unctuous, silken, glorious sauce known to man. Top that with a deviled egg ([insert twang here] "How Southern of you, sir!) --talk about steak and eggs! Leggo my huevo! The potato cake was very interesting, indeed. It was a little sweet and matched best with the 3-mustard sauce underneath (A melange of all three Lusty Monk Mustards, I presume). Crusted with panko and mixed with Romano and aged cheddar, I asked Chef George what was it that made the potato cake sweet. "Was that on the pantry truck?" I asked, surprised. "No. We made it and folded it in." "Why not? We decided to do it to make it interesting." And that's why they pay him the big bucks, folks. The first dessert, courtesy of Chef Blackburn's team, was a labor of love. The deep, dark rich, almost maple-y scent of molasses filled the room and this was only my second favorite part. The lone lady on the chef's team, Carmen, is the talented pastry chef at Greensboro's Table 16 and she created this dessert. In the post-dinner interview with Jimmy Crippen, she said the cake was something from her childhood. She roasted off some squash and put it in the ice cream with the duck eggs and I can honestly say it was the best ice cream that we've had during Fire in the Triad. The honey-comb: I was trying to think of a way to take it home in my purse because I had no pockets on my dress. It didn't last long, but I held onto it as long as I could without jeopardizing my live tweeting. The last course, presented by Chef George, was the perfect ending of the night. Dessert just got real. Like, just now. I flipped my napoleon over to eat each layer separately and the torte was the best part. I followed it up with the cheesecake, and I was a little underwhelmed. It was flavorless and a little grainy. Following that up with the chocolate cake redeemed the dish, in my eyes. The caramel sauce was perfect and when spooned on the cheesecake, it made it taste better and the grainy texture was forgotten about. All six courses ate like a complete meal. Each course was well-prepared, well-executed and absolutely fantastic. My expectations were whisked away as soon as the first course was set before me. If you're reading this, you need to know that Battle Eggs was singularly the best meal of the competition (in my humble opinion) and I am a fan. A raving one. I was blown away by the flavors, execution, creativity and usage of each egg. Thank you for an unforgettable meal. I can't wait to visit each of you at your restaurants and let your creativity and your staff take care of me. Chef Neal has been ushered through to the Fire in the Triad finals that will take place next Tuesday, against tonight's winner. 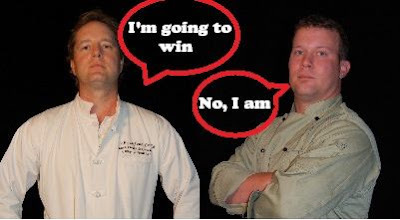 Stay tuned to find out: Will it be Chef John Milner of Milner's or Chef Michael Harkenreader of Undercurrent?? Will Winston-Salem be able to claim victory of our Hometown Guy? Or will it be a battle between top Greensboro chefs? Only the palate can tell. All photos courtesy of Competition Dining, unless noted.